A speedy weeknight stir-fry that packs in maximum flavour in under 30 minutes. Not a fan of beef? Try using chicken breast instead. Heat the first tsp olive oil in a frying pan over a high heat, then add the sliced brussels sprouts and cook until softened and charred. Transfer to a chopping board. Toss the steak in a bowl with the cornflour and five-spice powder. Heat the remaining 2 tbsp olive oil in the frying pan until smoking hot, then add the beef and fry, stirring all the time, until golden and crisp. Remove with a slotted spoon, then add the spring onions, garlic and ginger. Stir-fry for 2-3 minutes, without letting the garlic and ginger burn. Stir in the basmati rice and stir-fry for another 5 minutes until the rice is warmed through. Pour in the rice wine vinegar, soy sauce, sweet chilli sauce, stir, then bubble for 2 minutes. 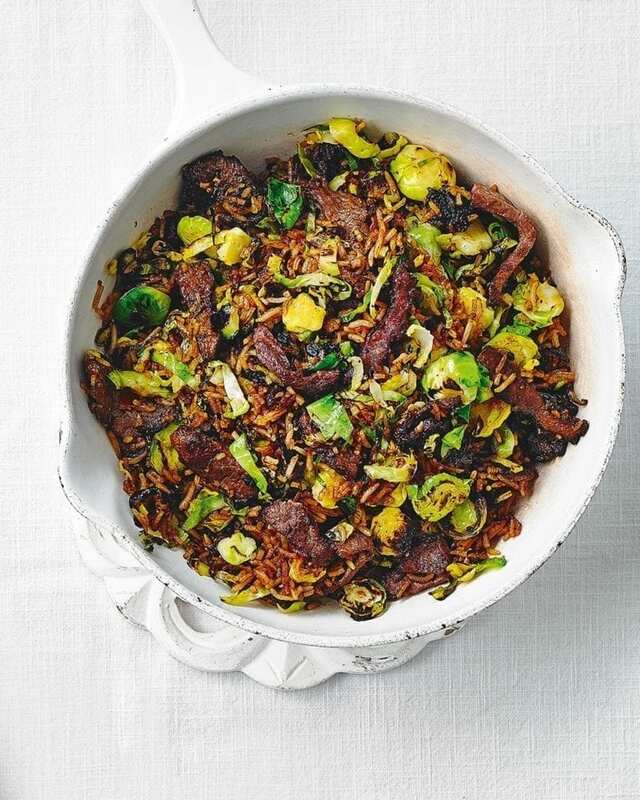 Return the beef and charred sprouts to the pan and toss well to coat. Divide between 2 bowls and drizzle with a little chilli oil to serve, if you like.